Pencil drawing of the Observatory of Jai Singh at Delhi by an anonymous artist, 14th November 1826. Inscribed on the front is: 'Delhi. S.S.W. 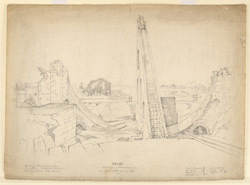 view of Observatory from Sketch by P.T.C. Novr. 14th 1826', with notes on the measurements and types of stone. Known as the Jantar Mantar, this observatory in Delhi was one of five built by Maharaja Jai Singh II in around 1724. The Mughal emperor Muhammad Shah gave this task to Jai Singh, a keen astronomer, in order to revise the calendar and astronomical tables. The observatory contains 13 different instruments for calculating the time of day, the altitudes of heavenly bodies, the positions of constellations etc. The instruments are still used today to forecast temperatures, calculate the expected arrival, duration and intensity of the monsoon season and the likelihood of flood or famine.